Update: Check out is twitter down dot com. I read a recent twitter by Biz Stone that says you can follow key words by typing “track tag” into your IM. It will only work on SMS and IM now. I tried it out by logging into my gmail and opening up my twitter IM box. 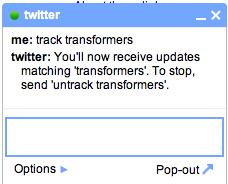 I typed “track transformers” so now when anyone talks about transformers I will get that twitter conversation. This means I can get it from people I’m not following. I was going to track something more common to test it out like “the” and then I realized I’d be flooded with useless twitters from people I’m not following. When the day comes that I don’t want to follow transformers how will I turn it off? How can I silence the key words I’m tracking at one relevant moment and irrelevant the next? Many bloggers use twitter for tips to find out what is launching or what is going on around personalities we are following. For the news relevant key words that get old there must be a way to “untrack” them. Update: Sometimes what is new news to you is news. Tech Crunch wrote about this in September. LOL! Bless U! U gave me a good little giggle tonight! Yeah, the tracking feature while not new news is nevertheless awesome! I still find people who don’t even know about it! I track about 20 key words on any given day! To untrack them you simply text or im “untrack” plus your keyword. Twitter will reply with a confirmation. You are so cute Sarah! Type “help” on Twitter IM, you’ll get some new tips like this.